Edmund Callis Berkeley (1909–1988, see biography of Edmund Berkeley) is an American computer scientist, publisher, and a social activist, who worked to achieve conditions that might minimize the threat of nuclear war. 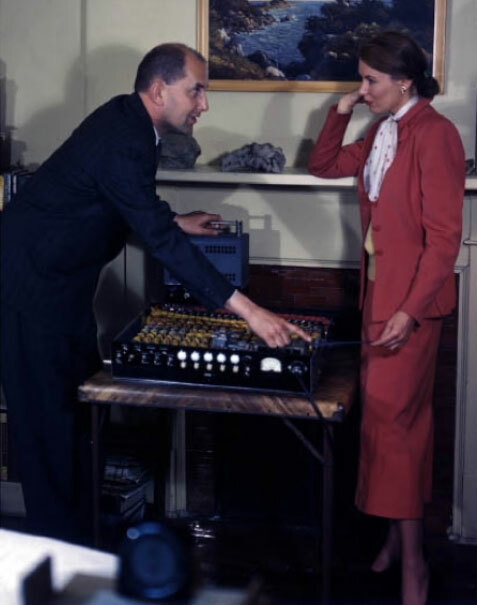 First meeting of Berkeley with computers was in 1939, when he visited Bell Laboratories to see George Stibitz's Complex Number Computer. Next was in 1942, when he joined the U. S. Navy and worked at Dahlgren Laboratory as a mathematician. There, he was assigned to Howard Aiken's Harvard Laboratory and observed Mark I and worked on building on the next sequential calculator project (Mark II). In November, 1946 he drafted a specification for Sequence Controlled Calculators for the Prudential, which led to signing a contract with the Eckert-Mauchly Computer Corporation in 1947 for one of the first UNIVAC computers. In 1949, when Prudential forbade him to work on projects related to avoiding nuclear war, even on his own time, Berkeley left to become an independent consultant and found his own company—Berkeley Associates. 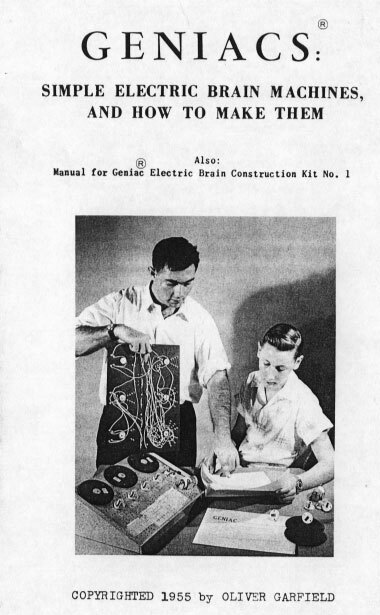 Shortly after the establishment of his company, in 1949, Berkeley wrote one of the first books on electronic computers for a general audience, which made him famous—Giant Brains, or Machines That Think (see the book). In the book he described the principles behind computing machines (called then "electric brains", "mechanical brains", "sequence-controlled calculators", or various other terms), and then gave a technical but accessible survey of the most prominent examples of the time, including machines from MIT, Harvard, the Moore School, Bell Laboratories, and elsewhere. Berkeley stated, that in the future "automated library" catalogue records (and, eventually, the documents) would be on microfilm and retrieved by a digital computer: "You will be able to dial into the catalogue machine 'making biscuits.' There will be a flutter of movie film in the machine. Soon it will stop, and, in front of you on the screen will be projected the part of the catalogue which shows the names of three or four books containing recipes for biscuits." In the above-mentioned book, Berkeley also outlined his own project, which seems to be the first personal computer in the world, called Simon—We shall now consider how we can design a very simple machine that will think. Let us call it Simon, because of its predecessor, Simple Simon... Simon is so simple and so small in fact that it could be built to fill up less space than a grocery-store box; about four cubic feet... It may seem that a simple model of a mechanical brain like Simon is of no great practical use. On the contrary, Simon has the same use in instruction as a set of simple chemical experiments has: to stimulate thinking and understanding, and to produce training and skill. A training course on mechanical brains could very well include the construction of a simple model mechanical brain, as an exercise. 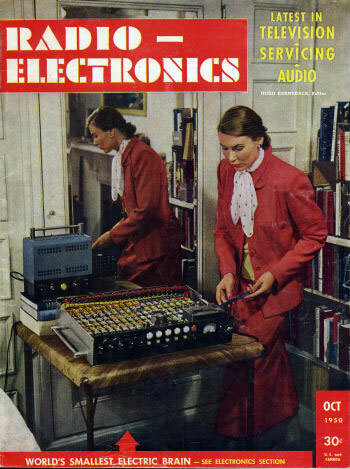 Plans on how to build this computer, as well as a general description of the computers state of the art, were published in a series of 13 consecutive articles (see the first article, which is an introduction to Simon and relay logic) of the journal Radio Electronics, starting from October 1950 issue (see the nearby photo of the front cover of the journal). Who built the prototype of Simon? 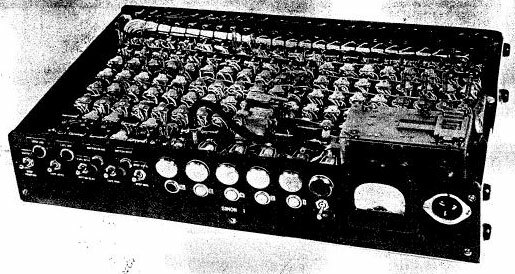 The first working model was built at Columbia University, and it was a combined efforts of a skilled mechanic, William A. Porter, and two Columbia University graduate students of electrical engineering: Robert A. Jensen and Andrew Vall. Porter did the basic construction, while Jensen and Vall took the machine when it was still not in working order and engineered it so that it functioned. Specifically, they designed a switching system that made possible the follow-through of a given problem; set up an automatic synchronizing system; installed a system for indicated errors due to loss of synchronization; and re-designed completely the power supply of the machine. Simon is a simple Harvard architecture machine, containing 129 relays (readily available at army surplus stores at that time), a stepping switch, and a five-hole paper tape feed. The program is executed directly from paper tape. Program instructions and data are input via a 5-level paper tape reader (5 bits or holes wide), as 5-level paper tape was standard for use with teletypes before the advent of ASCII. Data may also be input manually via the front-panel switches during program execution. Various registers are provided, some for general data storage, others for targeted purposes. The registers and busses are a mixture of 2- and 4-bits wide. The processor (ALU) is also 2-bits wide. Output is via the 5 lamps, connected to the Output Registers. Operations performed by Simon included: addition, negation, greater than, selection and several bitwise operations. To program Simon one have to prepare a paper tape with the machine instructions and data. The paper tape is the program memory: Simon executes the program instructions as it reads the tape, it does not load the program. The tape reader reads in one direction only. All instructions on the tape are executed in sequence, there is no opportunity to skip instructions or branch. Some degree of conditional operation is provided for by the selective assignment function of the ALU. There is one opportunity to create a loop by forming the entire program tape into a loop. A program may include programmed halts. Program execution stops, and the machine waits for manual indication before resuming execution. The output lamps can be observed at this point and/or a data value can be input from the front panel. As an educational instrument, Simon was directed more towards the electrical implementation of logic and introducing the principles of binary arithmetic, logic and automatic computation to a wider public, than towards programming. As such, and as a minimal machine, programmability is rather limited. The one saving grace may be that the program can be quite long (limited only by paper tape handling), a feature that certainly would not have been feasible in an attempt to make an inexpensive stored-program machine at the time. Initially Simon cost about $600 to construct. By 1959, over 400 Simon plans were sold. What makes "Simon" unique? According to Mr. Berkeley, the machine has established at least half a dozen world's records. - It is the smallest complete mechanical brain in existence. - It knows not more than four numbers; it can express only the number 0, 1, 2 and 3. - It is "guaranteed to make every member of an audience feel superior to it." - It is a mechanical brain that has cost less than $1,000. - It can be carried around in one hand (and the power supply in the other hand). - It can be completely understood by one man. - It is an excellent device for teaching, lecturing and explaining. Later Berkeley designed and sold several other simple calculating devices and robots like Squee (an electronic robot squirrel), Geniac (Genius Almost-Automatic Computer) (see the lower image), Tyniac (Tiny Almost-Automatic Computer), Weeniac (Weeny Almost-Automatic Computer), Brainiac (Brain-Imitating Almost-Automatic Computer), and Relay Moe (a tick-tack-toe machine with variable strategies). 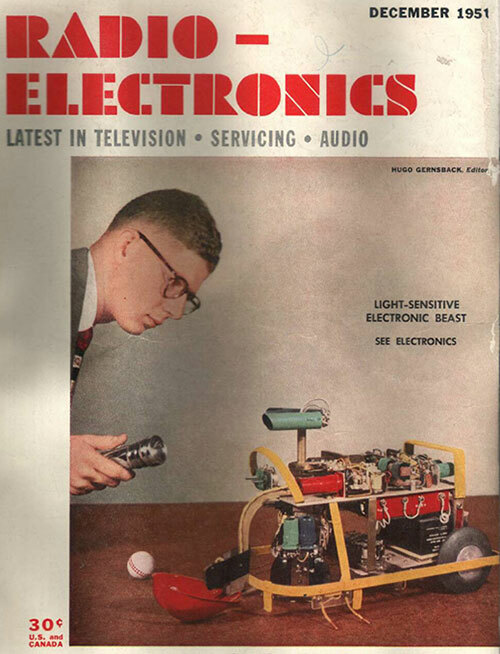 The Squee robot was the featured construction project on the cover of the December, 1951 issue of the journal Radio-Electronics (see the lower image). 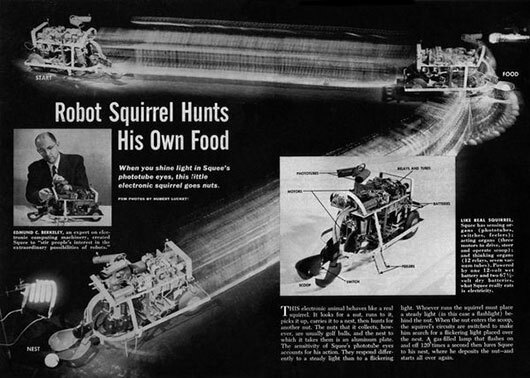 It was an electronic robot squirrel, which had four sense organs (two photo-tubes, two contact switches), three acting organs (a drive motor, a steering motor, and a motor which opens and closes the scoop or “hands” in the front), and a small brain of half a dozen relays. The Squee has been called the first of the true robots, because it was the first robot able to carry out a defined task, as opposed to just steering towards light. Squee was also the first robot to have a manipulator under automatic control. The primary goal of the Squee is to hunt for a “nut”. The “nut” is a tennis ball designated by a member of the audience who steadily holds a flashlight above the ball, pointing the light at Squee. Then Squee approaches, picks up the “nut” in its “hands” (the scoop), stops paying attention to the steady light, sees instead a light that goes on and off 120 times a second shining over its “nest”, takes the “nut” to its “nest”, there leaves the nuts, and then returns to hunting more “nuts”. When Squee is operating, it is a dramatic and exciting example of a robot. The machine however is sensitive to the surrounding light level, and usually has to be shown in a room about 8 by 10 ft. with only a small amount of overhead light and black curtained walls. It seems Berkeley constructed only one example of Squee, still preserved at the Computer History Museum in Mountain View, California. In 1956 Berkeley published an article (see Small Robots Report), summarizing his ideas, and stating that he had spent $4000 developing Simon. Berkeley's books and computer/robot kits had a significant impact on the future of computer development and directly influenced many computer pioneers like Ivan Sutherland and Wesley Clark.